"You lie. You are the Menoptra. Our detectors show you are massing in space to attack. Speak!" The Doctor speaks to the voice who does not believe they are travellers and are spies for the Menoptera. It attacks the Tardis but it emerges Vicki has realigned the fluid link to reactivate the power. Zarbi are stalking the remaining free Menoptera Vrestin. The voice offers the Doctor his freedom in return for assistance defeating the Menoptera invaders. The Doctor is coerced into bringing out his astral map to pinpoint the invasion force. Vicki is retained as a hostage while the Doctor and Ian fetch the map. While inside the Doctor treats Ian's injured face. 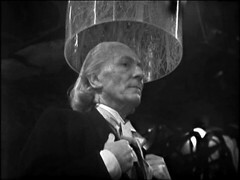 The Doctor likens the voice to the ant queen and asks Ian to escape & track down Barbara. He escapes leaving the Doctor & Vicki with the Zarbi. While wandering the tunnels of the base he is pursued by Zarbi. 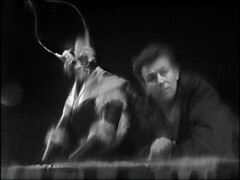 The Doctor detects transmissions from the Menoptera fleet and learn they are planning to land at the crater of needles, where the slaves are held. Ian is trapped by the Zarbi but a Venom grub cutting through the wall allows him to escape at which point he meets Vrestin. On the pretext of fetching equipment, the Doctor sends Vicki into the Tardis and she emerges with what he says is the wrong box, containing a spider specimen which the Zarbi recoils from in terror. Vrestin tells Ian that Vortis is their planet, and they are reclaiming it not invading. Menoptera and Zarbi lived side by side. The Zarbi were enslaved by the dark power of the Animus which caused the Zarbi's base, the Carsinome to appear and grow. The Menoptera were driven off planet to one of the moons attracted to the planet by the Animus. They have returned to Vortis to destroy the Carsinome before it envelops the planet. Vrestin was part of the scouting spearhead. They leave for the Crater of Needles to rescue their friends there. They are waylaid by Zarbi but as they are cornered the ground gives way beneath their feet burying them. Oh that's much more like it. I didn't get on with the first two episodes, but this one is much better. Some explanation of what's going on, some action and some plot advancement. Nice one, best episode of the story thus far. The more I watch Doctor Who in order, the more convinced I become that it's natural unit isn't the story but the episode. The whole episode was recorded in one session on these early stories and some weeks they pull it off ok, and in others it goes pear shaped. This time out I've found two better than three! The episode is mainly the three regulars trapped in the Carsinome and communicating with the disembodied Animus. Yes there's some action during Ian's escape and some brief, but effective, shots of Vrestin flying but I found it mainly static this time. VRESTIN: Heron? Do you still intend to go to the Crater of Needles? VRESTIN: Many of my friends are enslaved there. They tear off our wings so that we may not escape. IAN: What do you expect when you invade a planet? VRESTIN: Invade a planet? Vortis is ours. We the Menoptera, are reclaiming it. IAN: Vortis is your planet? VRESTIN: Of course. They are returning to the Carsinome. They do not search for long. IAN: Those things invaded your planet? VRESTIN: You do not know our story? IAN: No, I don’t. Tell me. VRESTIN: The Zarbi are not an intelligent species, but they were essential to the life pattern here. We lived at peace with them, until they were made militant by the dark power. IAN: The dark power? What’s that? VRESTIN: The Animus. At that time, the Carsinome appeared. Grew like a fungus. We had no weapons. We had not had the need. And by the time we sensed the danger, the Zarbi were too strong. IAN: So you left the planet? VRESTIN: We had no choice. IAN: Where did you go? VRESTIN: At that time, these strange moons appeared. One of them became our home, those of us who could reach it. IAN: Can you live up there? VRESTIN: It is a dim, half-world and our wings grow weaker. We must return to Vortis, for when the Carsinome encircles the planet, it will be too late. IAN: And now you’re ready to attack? VRESTIN: No, we are not ready, but we must try. IAN: I see. And what’s your part in all this? VRESTIN: Three of us were sent here to prepare the way for the invasion force. Now, I am alone. I do not know. IAN: The Crater of Needles? IAN: Yes, like friend Barbara. Vrestin, we’ve both lost friends. Come with me to the Crater. You know the country. We can collect your friend and mine. VRESTIN: There are many of my friends in the Crater of Needles. IAN: All the more reason to go. In that we get all the background information we need for the story to make sense. Barbara is completely absent from this episode - I assume Jacqueline Hill was on holiday this week? Likewise Hrostar, who she was last seen with, is also absent although Vrestin does confirm his survival. 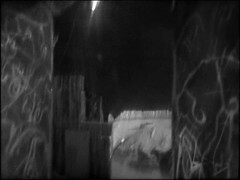 This episode also features one of the great Doctor Who mistakes as a Zarbi, walking towards us, actually walks into the camera, bumping it upwards and revealing (right photo) what looks like a strip light on the studio ceiling! 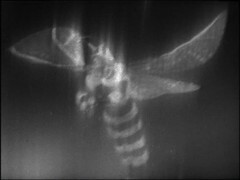 The episode title "Escape to Danger" is familiar to a legion of Target Doctor Who book readers as a frequently used chapter title appearing in The Daleks (David Whitaker), The Zarbi (adaptation of this story by it's on-screen author), Curse of Peladon (Brian Hales) Genesis of the Daleks, Keeper of Traken & An Unearthly Child (all Terrance Dicks) and Vengeance on Varos (Philip Martin).